We are proud to announce something you probably already know: Jackie is a Super Lawyer! 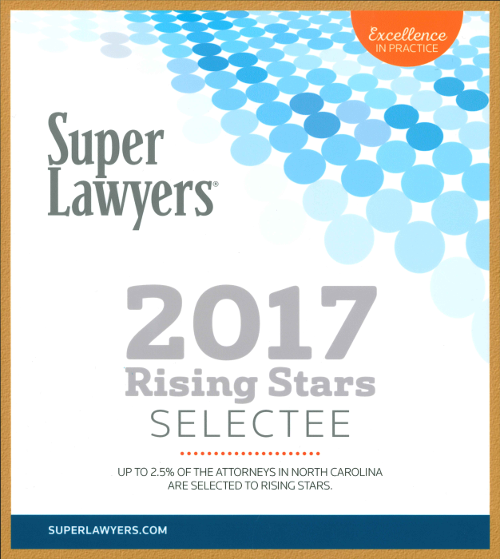 The Super Lawyers rating service has named Jackie Bedard as one of its 2017 Rising Stars. The rigorous selection process is based on a 12-point evaluation of attorneys’ backgrounds, professional achievement, and peer evaluations. The Super Lawyers list recognizes no more than 5% of attorneys in each state, and the Rising Stars list even more exclusive, limited to 2.5% of attorneys from over 70 different practice areas. Of course, as with last month’s Cary Magazine award for Best Attorney in Western Wake, none of this would be possible without Super Clients. Thank you for letting us serve you, and for telling others about us.